To make an awesome presentation with Biteable, plan the structure by starting at the end: look at what you want your audience to take away and work back from there. Don’t try to fit too much in, focus on no more than two or three main takeaways. Structure it like an essay: introduction, body & conclusion. This is also known as the ‘What, Why & How’ structure. In the introduction you should sum up the point of your presentation and why it is relevant or useful to your audience. In the body of your presentation you should be justifying why your audience should believe you with solid evidence. When writing the body, start by bullet-pointing your main ideas or evidence, put them in a logical order and then expand on them to create the copy. In the conclusion, briefly outline the main ideas and give the audience some solid ideas on how they can put what they have learned into practice. In your introduction, avoid the typical “Hi, my name is X and today I’ll be talking about Y” opener if you can. 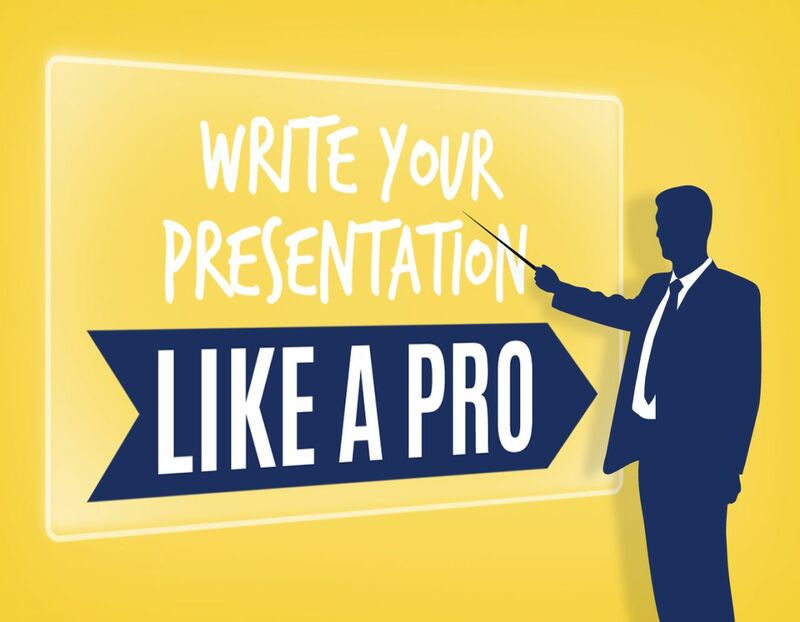 Presentations for Dummies recommends trying something a bit different like using a quote, telling a story, making a joke, making a bold statement, asking a rhetorical question, stating an interesting fact, making a list of three things or giving an interesting example. 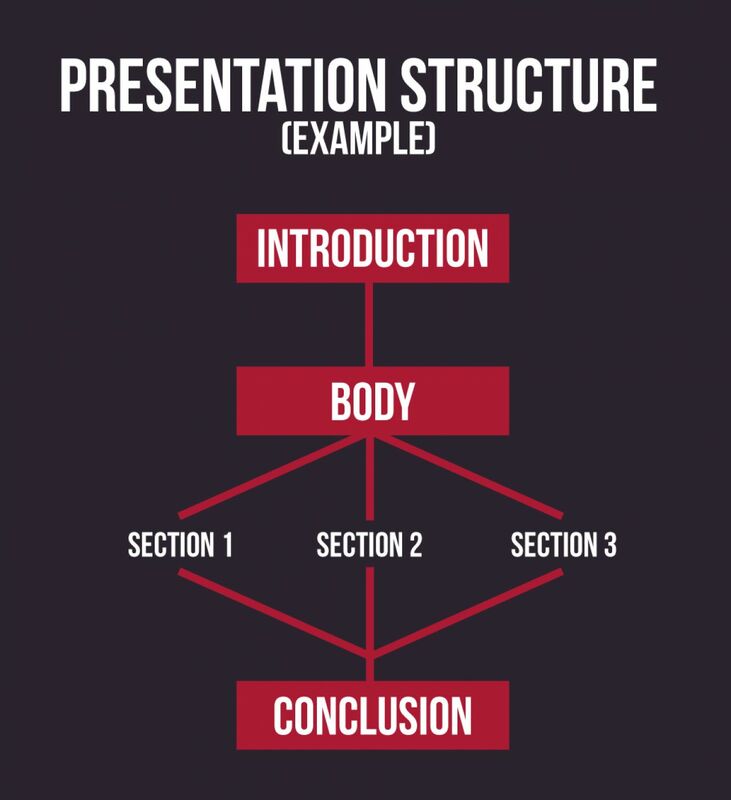 If your presentation is long, you might want to break it down into sections or chapters. People remember things better in bite-sized chunks, so if you can characterize your main points in distinct, recognizable blocks, it will help your audience retain more information. This also applies to the material in your chapters, so try to break the chapters down into distinct parts too, and limit dot points to no more than three per scene or slide. Don’t use buzzwords and jargon unless you’re absolutely sure everyone in the audience knows what you mean. Your aim is to communicate with your audience, not impress them with currently fashionable terms that may lack substance (weasel words). Simplify everything so it can be understood on the first pass because your audience can’t stop the presentation and go back if there’s anything they’ve missed. If your presentation is a little too factual or dry, try putting in a joke or otherwise lightening the mood. A good way to do this is to use a metaphor or simile. For example: “X is about as useful as a chocolate teapot”. Pick your audience however - humor is risky, so if in doubt, leave it out. Read through your first draft and weed out anything that’s not absolutely vital. Do this with concepts and with words. When you’ve finished, read it through aloud and imagine you’re doing the presentation in front of the audience. Any clunky sentence structure, poor phrasing or jokes that don’t work should immediately become apparent when you read it aloud. If you can go a step further and get someone to listen and offer advice, all the better. Consider it done only when you can read through the whole presentation without stopping to fix anything. If you know someone who is good at proofreading, get them to do it. Simple spelling, grammar or formatting mistakes in your presentation will make you look like an amateur no matter how solid your information. The spell checker on your word processing app doesn’t count as proofreading because it won’t pick up a correctly spelled word in the wrong context (“Can I come too the party two?”) and can quite often prompt you to change your grammar to something that’s incorrect. If you don’t know anyone who can help you, leave it for a day or two and then come back to it and edit it yourself with a fresh eye.